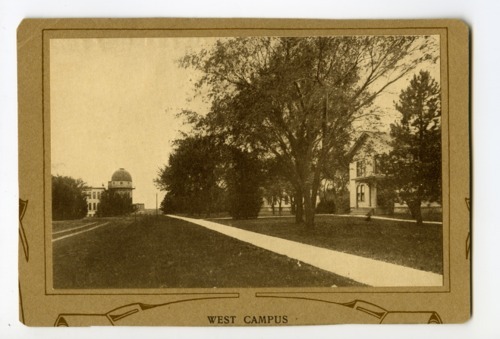 This sepia colored image shows a west view of the Washburn campus in Topeka, Kansas. In the background Crane Hall Observatory is visible. The campus is located on 160 acres of land, donated by abolitionist John Ritchie, in the central portion of the capital city. Established in February of 1865 by the Congregational Church, the school was named Lincoln College in honor of President Abraham Lincoln. In 1868, the board of trustees changed the institution's name to Washburn College to honor Ichabod Washburn, a wealthy industrialist from Worcester, Massachusetts, who gave a $25,000 donation to the college's endowment program. The school was later renamed, in 1952, Washburn University of Topeka.